Today I was a bit sad that it was the last day of the 2014 Winter Olympics in Sochi. I always look forward to watching the olympics and keeping track of it. It doesn’t matter what sport or event is on, I just enjoy watching it! It is a worldwide tradition! The athletes are inspiring as they are dedicated to their sport and also dedicated to their health. That’s something I admire. This year’s olympics, even though amidst controversies, was pretty good, in my opinion. Do you have a favorite winter olympic sport? I think I got into watching the skiing competitions more this time. I wish I could go watch the olympics in person sometime. Today while the last events were on the TV, I made khachapuri, a Georgian dish that I hear is a Sochi staple. While watching the live stream of the closing ceremonies online, I felt kind of like the bear shedding a tear in the program. But in my house, today is not only the end of the winter olympics 2014, but it’s Khachapuri Day! 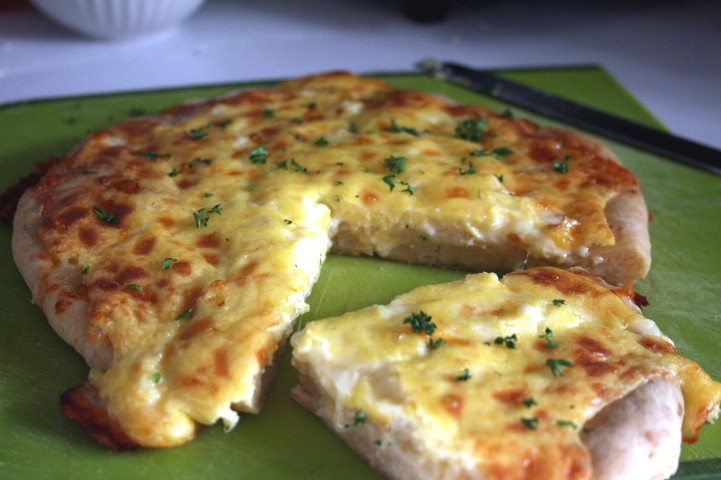 There are several variations on this dish, but all are pretty much delicious cheese breads. This is my take on Imeruli (Imeretian-style Khachapuri) stuffed with cheese and green onion. 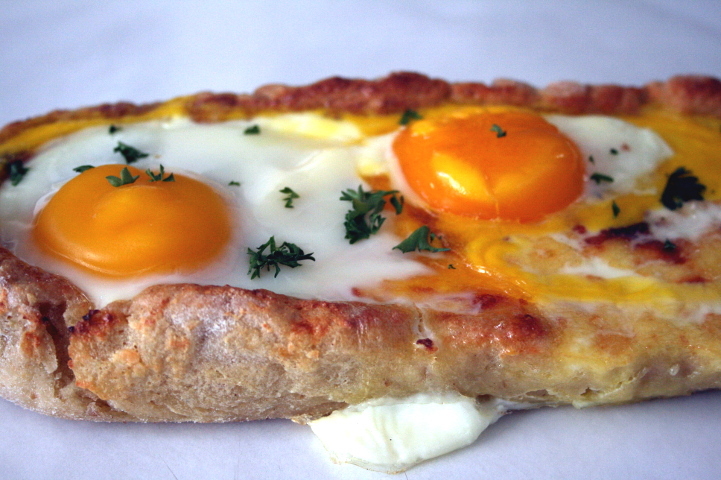 Then here is adjaruli, Adjarian Khachapuri, in a boat shape with a cheese filling and egg topping. I overfilled a bit, so the eggs slid and one yolk broke, so I had to put another egg on top. Hehe, anyways it was still cheesy delicious! And finally, the cheesiest of the three that I made, Mingrelian-style khachapuri stuffed with cheese and topped with cheese. I don’t think I will be able to find the traditional Georgian sulguni or imeretian cheese where I live, but I used a mix of mozarella, havarti, and muenster, which should give you a similar result. This is the khachapuri dough, which is similar to pizza dough. You can use the traditional recipe, but pizza dough works great too! I did a gluten free dough using Bob’s Red Mill flour mix and instructions. …gather up the edges, pinch, and seal! Like making a dumpling! Then you turn it over and flatten it some more. Poke some holes on top for air vents, and then it is ready to rest for a bit. For the adjarian (boat-shaped) version, the dough is rolled out into an oval shape and the filling is spread on top. You can see the flecks of ground flax in the dough. The boat-shape is made by pulling the sides, folding toward the center and pinching the ends for a seal. After half-hour rest, they go in the oven until golden brown. Megruli may be the cheesiest bread I have ever had! Prepare khachapuri dough according to the Pinch of Cinnamon blog (or use your favorite pizza dough). 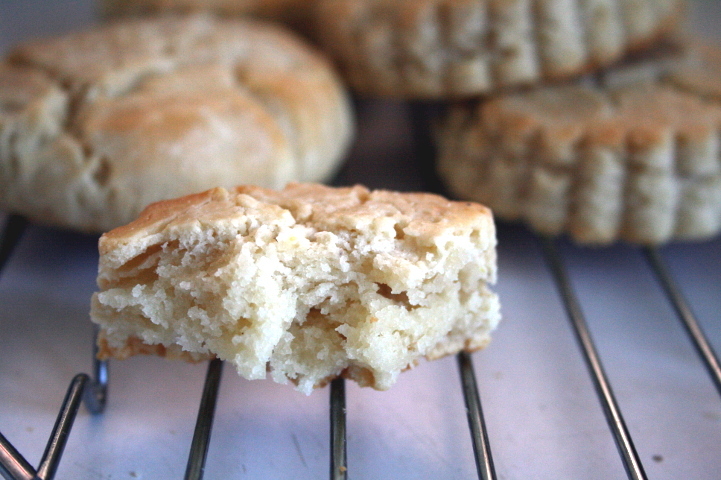 For gluten-free dough, follow the Bob’s Red Mill procedure. Make Cheese filling: For Acharuli, mix together the cheeses and 1 egg. Set aside until ready to use. For Mingrelian khachapuri, mix together half of the sulguni and half of the imeretian cheese with 1 egg and set aside–this is the topping. 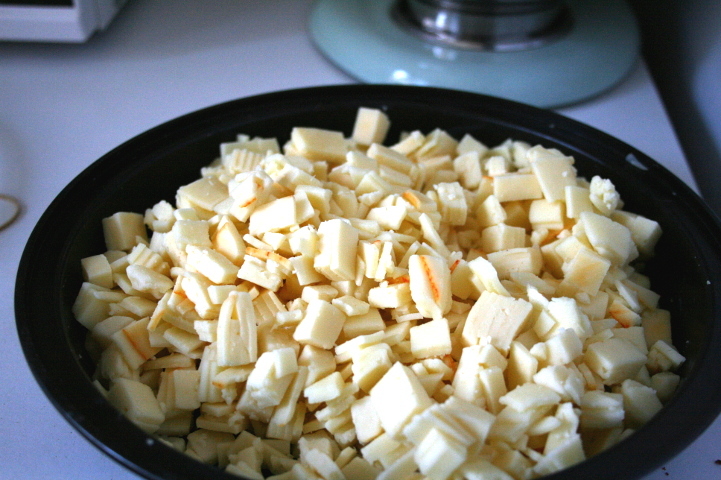 In another bowl, mix together the remaining cheese and set aside–this is the filling. For Imeruli, mix together the cheeses and the mixed greens. Set aside until ready to assemble the khachapuri. Assembly: For Acharuli, roll a portion of dough in an oval shape with a thickness of ~1/4 inch. Take the filling and spread on the dough, leaving a 2 inch border without filling. Fold the sides to the center and pinch the ends to seal, making a boat shape. For Mingrelian khachapuri, take one portion of dough and roll to about 1/4 inch thick round. Take the filling and place in center of the round. Lift the sides of the dough fold over the filling. Pinch the dough to make a seam. Turn the dough over and flatten with hands or use a rolling pin to make a thin disc of about 1/2 inch thick. 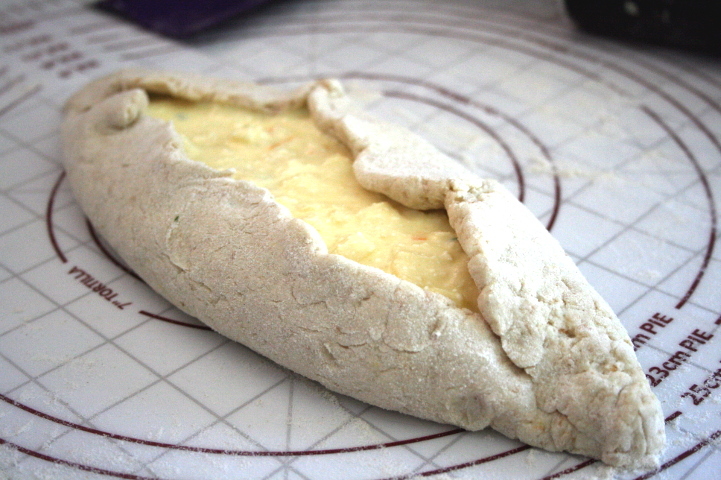 For Imeruli, follow the same procedure as preparing the Mingrelian khachapuri, using the Imeruli filling. Rest: After shaping, let rest for 15-30 minutes. Bake: For acharuli, place in the oven on the baking stone. Bake until golden brown, about 15-17 minutes. Take the remaining egg and crack it in the center of the boat. Bake for another 3-4 minutes, until egg is cooked to desired doneness. 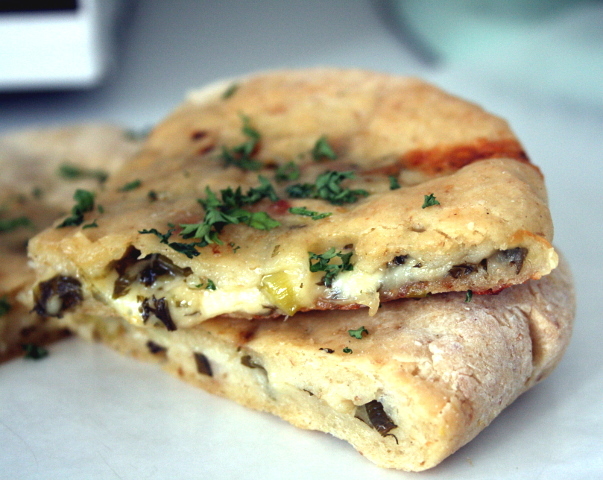 For Mingrelian khachapuri, place in the oven on the baking stone. Bake until starting to brown, about 12 minutes. Spread the topping and return to the oven. Bake for another 5-8 minutes or until crust and topping is golden brown. For Imeruli, place in the oven on the baking stone. Bake until golden brown, about 15-17 minutes. Farewell olympics! We’ve enjoyed it! Looking forward to Rio de Janeiro in 2 years for the Summer olympics and then 4 years for the next winter olympics in Pyeong Chang! In the meantime, we’ll be enjoying the khachapuri! This entry was posted in Baking, Cooking, Food, Gluten-Free, Recipes, Snacks and tagged 2014 Winter Olympics, cheese, cheese bread, Georgian cuisine, Khachapuri, Sochi. Bookmark the permalink. LIKE SO MUCH, samantha! We saw something similar to your cheesey eggy boats in Greece and I couldn’t get them out of my mind.. zomg! Ooh the Greek version sounds good! 😀 Would love to go there someday. Looks delicious and a great tribute to the Olympics! This is amazing! I’ve never seen a bread boat before, so I’m excited about that, but it’s also great that I have more East Europe foods to add to my repertoire, those seem to be the hardest recipes to collect. Please, keep sharing! These all look great! I’m not afraid of a ball of dough, so I think I could do this! Awesome! I hope you enjoy it! No need to fear the ball of dough! Thanks 🙂 it was fun to make!